Take a double boiler and add some water in bottom pot and bring to the simmer. In top pot add egg yolks and sugar. Beat well until light and fluffy. Whisk in 3/4C Marsala wine and place over boiling water. Whisk constantly until mixture becomes creamy and doubles in volume, about 5 mins. Remove from heat and whisk in expresso and cheese until smooth. Set aside to cool. Brush ladyfingers with remaining 1/4C marsala and line bottom and sides of a trifle bowl or suitable dish. Pour in half of cheese mixture, top with 1/2 of raspberries and some grated chocolate. Make a layer of remaining ladyfingers and pour over remaining cheese mixture. 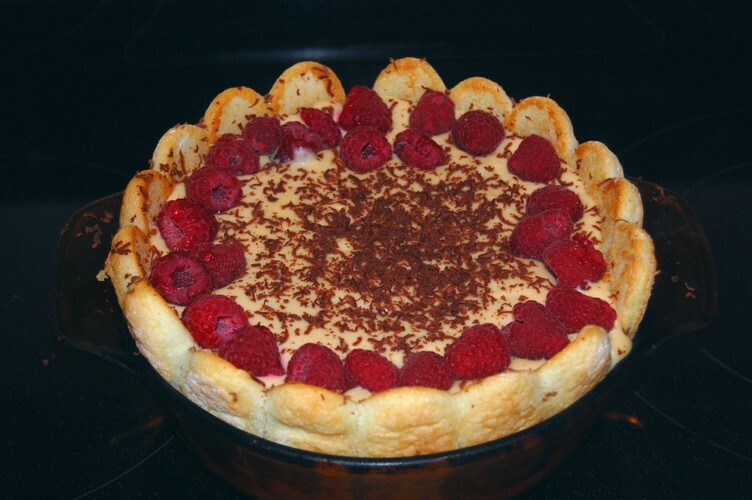 Top with raspberries and grated chocolate as in picture above. Refrigerate 8 hours or preferably overnight. Makes 8 servings and it's about 460 calories per serving. Oh it was a big hit at dinner. Very rich, I wouldn't want to make this more than once a year. Hmm...seems like I'll make this soon too!!!!! This is by far the best Tiramisu I have ever had. My hubs favorite is tiramisu! The raspberries are a great touch. Thanks for stopping by and commenting on my blog goals - looks like we have a similar outlook! New follower here.